Rownie, the youngest in Graba the witchworker’s household of stray children, escapes and goes looking for his missing brother. Along the way he falls in with a troupe of theatrical goblins and learns the secret origins of masks. Now Graba’s birds are hunting him in the Southside of Zombay, the Lord Mayor’s guards are searching for him in Northside, and the River between them is getting angry. The city needs saving — and only the goblins know how. 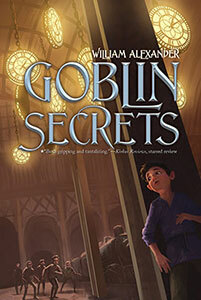 Signed and personalized copies of Goblin Secrets are available from Bear Pond Books. The last day of Kaile’s life does not start well. It’s Inspection Day at her family’s bakery, and between her mother’s temper, her little brother’s antics, and her job serving breakfast to the demanding citizens of Zombay, she could use a break. Then a goblin theatre troupe offers to put on a play for the customers. Kaile treasures the gift they give her–an innocuous little flute made of bone–and plays its haunting song without hesitation. That’s when her life officially ends, and her adventures begin. Set alongside the National Book Award-winning Goblin Secrets, Ghoulish Song weaves a story of music and mystery through the charmed, cursed world of Zombay. 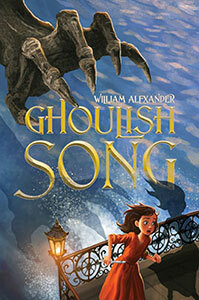 Signed and personalized copies of Ghoulish Song are available from Bear Pond Books.